You are cordially invited to this year's Professional Development Opportunity for German teachers, professors and advanced German students at McDaniel College, which will take place on the first weekend in December. Please fill out the online registration form, print it out and send it along with a check made out to AATG-MD by November 15. Description: Because language production is embedded in culture, promoting students’ intercultural sensitivity from the beginning can serve as the cornerstone for creating relevant, student-centered language instruction. This workshop references Liddicoat and Scarino’s Intercultural Language Teaching and Learning (2013) and offers language educators a method for working with and designing theme-based curricular units. On Saturday, Anja Veldhues from the Goethe-Institut Washington will talk about about recent development at the Goethe-Institut and what they offer for German teachers and students. We just completed a German student immersion day that put the Arts & Humanities back into STEM: STEAM! We toured three museums in German led by docents from the museums. At the NGA, we will explore German Expressionism in the newly remodeled East Building of the National Gallery of Art (NGA), the Newseum to see the Berlin Wall's graffiti as art, and in the afternoon we will tour the German-American Heritage Museum's current exhibit on Jewish Lawyers in Germany under the Third Reich as well as explore German immigration to the United States. German students from the area got to meet each other and learn more about connections to our area in the German-American partnership. 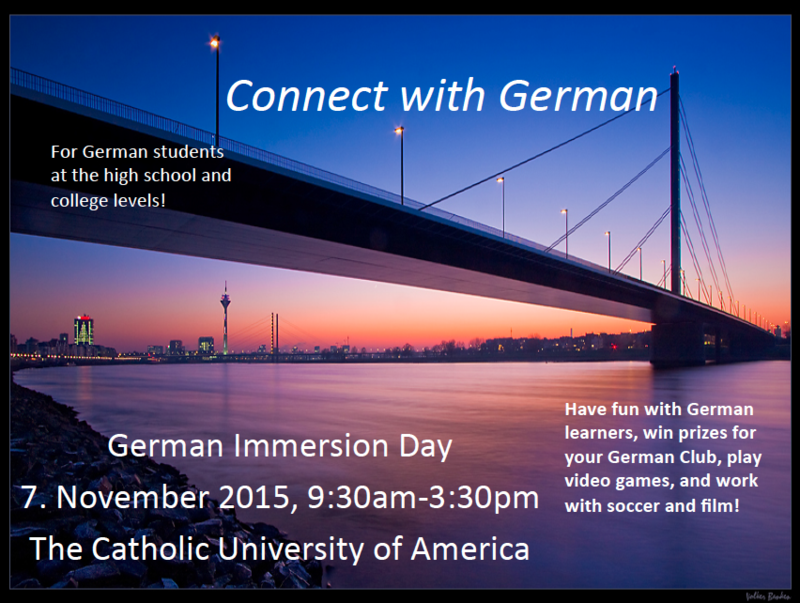 The “Connect with German” Student Immersion Day took place on November 7, 2015 on the campus of the Catholic University of America. The day was designed to build connections not only with the German language and culture, but also between our local German programs and between teachers and learners of German. We would like to thank the AATG, the Goethe Institut Washington, AGAS, and the Catholic University of America for their support of the event. During the day, students met other German learners who were combining their study of German with other fields of interest such as computer science, history, and business. Students worked in groups to build excitement in their German learning. Students were very proud to have spoken German all day and to have completed all their tasks by using the language. 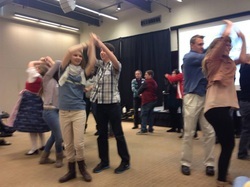 At the event, students participated in activities bridging American and German-speaking cultures. They played cultural games, linked elements from the different cultures to German-speaking culture in a race, learned about contemporary music, current events, and, in the afternoon, participated in a contest to create materials to encourage other students to sign up for German after they discussed their own reasons for learning the language. Congratulations to the University of Maryland – College Park and UMBC for their winning entries. Each German club received funds for their projects as voted on by the other participants. A big thank you to all the teachers who volunteered their time to help out at the event and encouraged their students to attend. I would like to thank the day’s organizing committee, Amanda Sheffer, Cora Hofstetter and Kristin Malone, for all their efforts to make the day a success! National President, and former Maryland-DC chapter President, Mohamed Esa presents at the teacher immersion day on April 11, 2015 at McDaniel College. Thanks to the amazing generosity of the German Society of Maryland once again, we will host the Annual High School Students Awards Ceremony. The event will take place May 17, 2015 at 3pm in the Adlersaal of Zion Church in Baltimore. 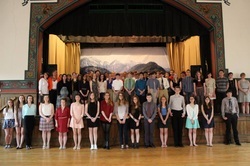 High school students who scored above the 85th percentile on the National German Exam will receive cash prizes. The German Society also plans to award college scholarships and other awards, as well. The day includes speakers, entertainment, prizes, and refreshments. Invitations have been sent to those involved. 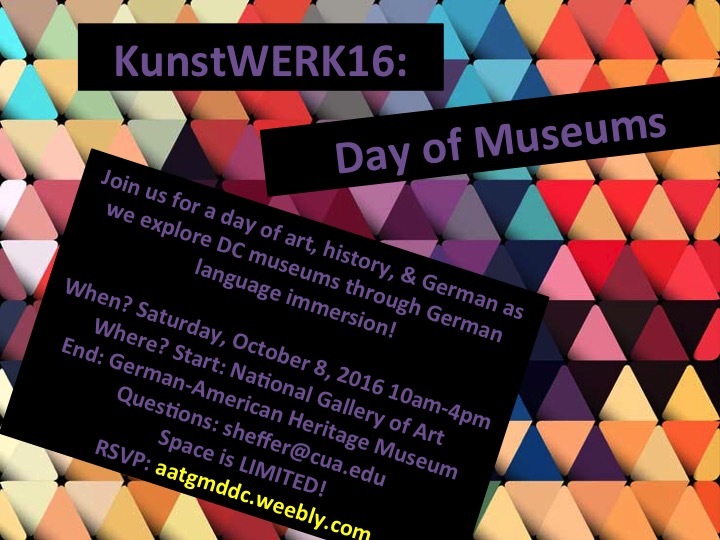 The AATG MD-DC has receiving funding for the new "Connect with German" Initiative to schedule a student immersion day during the fall of 2015. The grant is funded through the German government’s Netzwerk Deutsch funds. Thanks to AATG-MD/DC members Cerue Diggs, Katrina Griffin, Deborah Mifflin, Mohamed Esa, and Amanda Sheffer, who participated in a program at the national AATG office in Cherry Hill, NJ from December 5-7th, 2014. 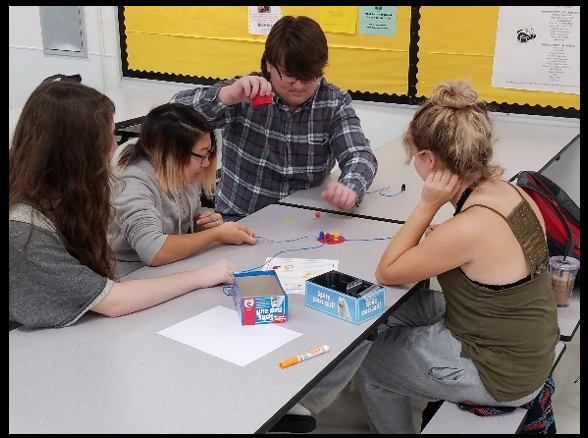 The goal of the program was to work with STEM as a form of outreach to underrepresented students in German. The team created materials, outlined professional development necessary to deliver these modules & strategies to increase German enrollment by reaching out to underrepresented students and their parents. Thanks for your work, AATG-MD/DC! A lovely spring day, McDaniel College, thirty-five registrants, and the expertise of Dr. Mohamed Esa-- who could ask for more! 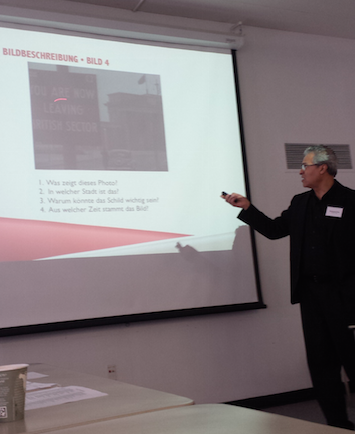 The day of April 11, 2015 began early with breakfast followed by the first of two workshops: Kurzfilm. Armed with lesson plans and handouts, Mohamed introduced us to three of the six short films featured in the book Kurzfilm German Short Films and Activities Manual, Volume 1 authored by Ingrid Zeller and Mohamed Esa. The activities and insights he presented brought the genre of short film to life for all of us. At the conclusion of the workshop, each participant received a copy of the book Kurzfilm , including DVD, to take home. 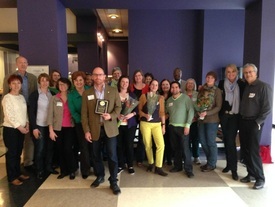 The midday luncheon featured our Annual Chapter Awards. Two persons were honored: Dr. Claudia Bornholdt and Mr. Carsten Krebs, Director Corporate Communications, Volkswagen of America. Claudia was honored for her innovative and dynamic leadership during her years as our chapter president 2011-2014. Carsten was honored for his outreach to and support of teachers and students of German in the Greater Washington, DC area. Recently he was one of the presenters at our German Means Green student immersion. Each awardee received an engraved plaque to commemorate the honor. Neue Technologien und On-Line Tools für den Deutschunterricht, the second workshop of the day, was exciting and hands-on. The workshop benefitted both APP-using beginners and those with more experience. Participants played with Adobe Voice and other apps that allowed animation and voice recording. From the Goethe Institut, participants received an 8-page handout of Apps für den Präsenzunterricht. I would be remiss not to include my thanks to our sponsors the Goethe Institute Washington, McDaniel College, and the AATG-MD/DC Metro Chapter. Thanks, too, to Mohamed’s team of students: Mariah Ligas, Tabitha Schade, and James Abdu. These three anticipated our needs and insured the smooth running of the day. Finally, a sincere thanks to Mohamed Esa, friend and colleague, without whom this Lehrerfortbildungsseminar would have been impossible. Featured Article in the National AATG Newsletter on the Event! Thank you to everyone who participated in the "German Means Green" event! We would like to especially thank our sponsors: STADaF, the Goethe Institut Washington, The Catholic University of America, the AATG Maryland-DC Metro Chapter, Baumann Consulting, Volkswagen, Recyclers International, and the Heidelberg Bakery. During the day, students learned about recycling, gained green vocabulary, saw portraits of what German-speakers are doing for the environment, heard from international companies on their green practices, and built their own solar-powered robots and cars. Congratulations go to Parkdale High School and The Catholic University of America's German Clubs who won prizes for their video submissions to the "German Means Green" video contest. For photos from the event, view our gallery.